Phil Pringle Doesn’t Mock, Judge Or Criticize Christians… Surely? “When you start saying, “This church is united. This church is not divided-” DON’T you DARE criticize and pull down your pastor or anybody else around here! If you want to do that, just go now! We’re having too much fun to have the critics and the miserable people around! Just leave now! If you want to be a builder then stick around. Most fools criticize and- you know, that’s the fact of the matter. Any fool can criticize and most fools do. The deal is, Jesus called us to build the church and we build it with words. We prophesied off the negative circumstance of the valley. We don’t go, “Aw! Oh look at these dry old bones! Golly! Their hopeless, those people! You know, my God! Dod you see her this week? She had the same dress as me, on. You know, I don’t know. Look at her hair! My God!” We get caught up with silly little things. Especially if you get offended. There’s stuff that’s gonna happen in church! And you might have your little pot plant commitment going on. You know, you’re a pot plant church! [inaudible] I met them! I mean church member. Where people have kind a got their little pot plant going on here and they been at a couple of churches. They’re looking around, going like, “Aww, I don’t know. You know, I’ve been hurt before in church life. You know, and something’s gonna happen. Something bad’s gonna happen – OH THERE IT IS! Alright I’m off!” Pick up your pot and off you go! And sit down at another church. That’s not unity. Break the pot. Let your roots go down in the congregation. Build something that lasts. You will flourish in the courts of God because you are PLANTED in the house of God! 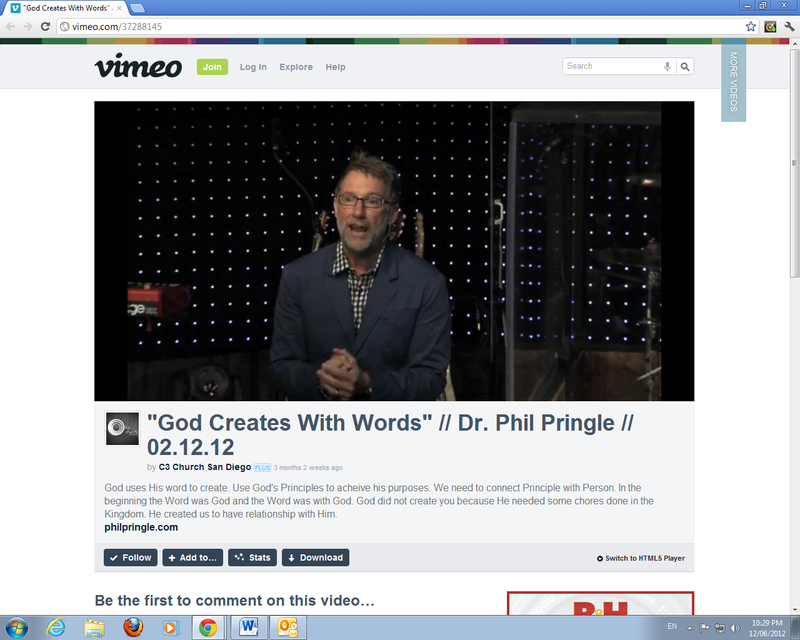 You’ll flourish once you’re planted.” – Phil Pringle, “God Creates With Words” // Dr. Phil Pringle // 02.12.12, Vimeo, http://vimeo.com/37288145, Uploaded by C3 Church San Diego, 22/02/2012. NOTE: SCREEN GRAB WAS TAKEN BEFORE 13/06/2012. This is a very manipulative sermon by Phil Pringle. Not only are the scriptures mangled for his gain, Pringle abuses the gift of God’s salvation by threatening people in his congregation of losing their salvation if they question or get critical about church or the pastor. The bible scriptures in this sermon do not support what he teaches. The allegory he uses for the scriptures borders on idiocy. He teaches the womans house is Pringle’s ‘house of God’ and people need to financially support what Pringle is doing. The issue with this allegory is if it is her home – isn’t it her ‘house of God’? Doesn’t this mean people should invest in their own homes for a ‘prophet’ who might come their way so they can bless that prophet THEN be blessed? How could Pringle make the bible about himself and suggest that people need to make room for him as an Elisha-like prophetic figure?